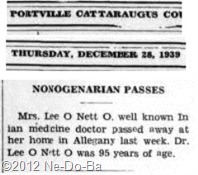 Mrs. Lee O Nett O, well known Indian medicine doctor passed away at her home in Allegany last week. Dr. Lee O Nett O was 95 years of age. Hmmm………! More questions than answers again! The woman living in Allegany in the 1920 Census was age 50, so born about 1870. The woman living in Allegany in the 1930 Census was age 62, so born about 1868. This is pretty consistent and supports a birth year of 1869 ± 1 year. The woman that died in Allegany in 1939 was claimed to be 95 years old, so born about 1844. That is 25 years older than the woman found living here in census records. Leonette Dodge was in Stockton in 1892 at age 42, so born about 1850. In 1900 she was in Pomfret at the age of 54, so born about 1846. When she married Charles Dodge in 1888 she was 35 years old, so born about 1853. The range of birth years (1846 to 1853) is a little wide, but I’ve seen much worse. No matter what year you pick, this woman is clearly more than a decade older then the other woman and could be as much as 25 years older. This death notice has to be for the older Dr. Lee-o-netto. Doesn’t it? Did Leonette Dodge move in with the younger Dr. Lee-o-netto? I see no reason why it couldn’t have happened. However it seems the paper might have mentioned there were two, if there were, so folks would know which one died. Wouldn’t they? I have often thought the two ladies might actually be the same person, but the censuses ages show two women approximately 20 years apart in age. Now this death notice has me back to thinking there is only one Dr. Lee-o-netto and that she somehow made her self younger. A temporary Fountain of Youth? My question to my readers is this – could a roughly 72 year old woman pass herself off as being only 50? Then 10 years later when she was 80 to 85 years old she passed as 62. Personally, I find it very hard to believe. What do my readers think about this? This has put me off so much that I just decided I need to learn more about the business card photo of Dr. Lee-o-netto. I need to date this photo and try to come up with an approximate age for the woman in the photo. I think this is an important enough piece of the puzzle to hire a professional. The Maine Genealogical Society is hosting Maureen Taylor, The Photo Detective for our Spring Workshop. I had already signed up to attend this day long workshop to increase my knowledge about family pictures. I decided to spend an extra $30 for a one-on-one 15 minute consultation with her to see what material data can be coaxed from this low-res photo. I sure wish I could get an original, but that’s too much to wish for. I can have up to 3 photos for the consultation, so if there is anyone out there with any pictures of any Dr. Lee-o-netto – Please, Please, Please share a hi-res digital copy of it with me before 8am on April 21. Really interesting- and that a “business card” with her image still exists! Good luck with the search and please up date! I will be very interested to know! Just keep following the blog if you want to stay up to date. I have a long way to go before I am finished with Lee-o-netto. There is a probate file, but it may just add MORE QUESTIOS!